You guys, I'm excited. I'm excited to have another project off the needles! My third pair of socks, to be exact. Which really surprises, if I must say because lately I've been feeling a little discombobulated when it comes to my knitting. I feel like I've been flitting from one project to another without achieving any sort of progress on anything. Some days, I feel like knitting but then I can't decide what to work on - even though I know I have way too many WIPs on the needles that I know I should be finishing up. In the end, I wind up knitting on nothing and find myself dusting my perpetually dusty house (what the...someone better go check and see if pigs can fly). I've been doing some more spring cleaning. Ok, fine. I've been purging. I got rid of some unsightly so-called storage-type furniture that was not actually storing anything other than junk and made the house feel and look overly cluttered. However, there were some long forgotten WIPs hiding out in there and now my sense of guilt is through the roof. Having four garments, four shawls, two supposedly small and quick (not for me!) projects, and a handful of socks on the go (some, I've lost the yarn and therefore have no second sock or can't remember the pattern to continue on) will do that to a knitter. I've left these WIPs on my desk as a way to remind myself that I must finish them before casting on another project because I'm definitely one of those people who have that mentality of if it's out of sight then it will absolutely be out of my mind! So, lucky for me this sock project whipped up so quickly that I only had time to mention them briefly in this post. I didn't realize just how much fun and rewarding knitting up those pill-shaped mini skeins would be, since I have no idea what the patterns in each mini would be, watching the colours form and take shape was highly amusing and made for quite the popcorn knitting. I have a feeling I'll be knitting up my Opal advent calendar faster than I thought I would as I can't wait to dig into the rest of my minis! For this first pair, I decided to use some leftover solid colour sock yarn for the toes, heels, and cuffs in an effort to bring all the minis together and make the socks look somewhat cohesive. I had no idea that as I was taking and knitting up the minis as they came numerically out of the box, that the colours would play out so well. The socks almost look like they were planned this way! I used my usual number and plain vanilla sock recipe, and originally was planning on doing an afterthought heel. At the last second I decided to try something out - instead of the afterthought heel I switched my yarn to the solid blue and started the Fish Lips Kiss heel and then switched back to the Opal when it was time to start knitting in the round again. I couldn't be more pleased with how it turned out! Even though there's an extra end to weave in (no more so had I done an afterthought heel), I think this will be my new go-to for when I knit socks with self-striping yarns! And the best part, no needing to pick up stitches!! Not that I mind picking up stitches, oddly enough I actually enjoy picking up stitches, but with this no-to-me way I can just keep on knitting. As for how I divided up the minis, well, I kind of got lazy. On the first sock, I had knit up what I thought was half of the mini and then actually weighed it out to make sure (note to self: must find a pocket scale without looking dodgy). Then when I was knitting up the second mini, I used the first mini as a size comparison to eyeball and guesstimate if I had used up half of the mini or not. I think I did a pretty bang up job as both socks look quite matchy matchy! Sweet! This pair used up only three minis. Well, three and a few metres of a fourth (which you really can't tell too much!) because I got paranoid on the first sock that I was going to use up too much of that third mini and will end up short on the second sock. Yeah, I overreacted as I ended up with a few metres leftover of that third mini when the socks were completed. Oh well. Something to keep in mind for next time. I think I'm going to get more socks out of this advent calendar than I had originally thought. I had estimated that I might get five or six pairs if I used around four or five minis per pair. If I keep using a contrasting yarn for the toe/heel/cuff for future socks I can potentially pull off eight pairs!! But I'm thinking of knitting up a pair of Rose City Rollers as the next Opal minis socks. Who knew that knitting mismatched, Frankensock type socks could be so much fun? Have you knit a pair of socks using mini skeins or leftovers? I can't wait to tackle the rest of my Opal advent calendar and to dig into my huge pile of leftover sock yarns!! Not washed and blocked yet...hence the obvious ladders! 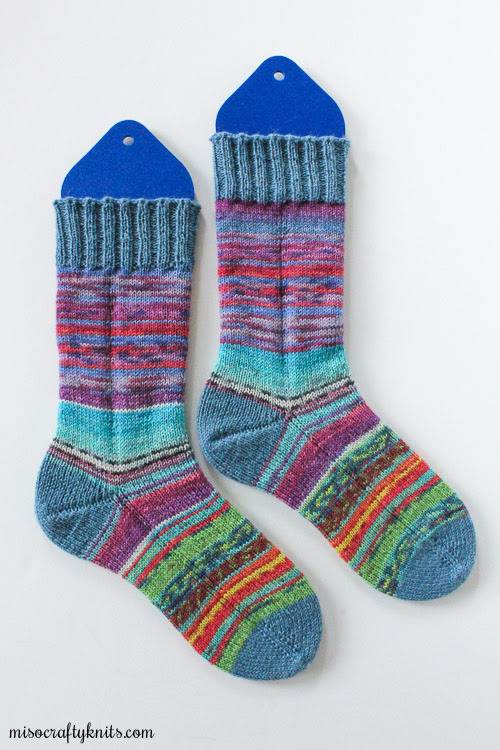 such wonderful socks, and a clever use of the mini skeins. Love how you pulled these colours together.